In this article I will show you step by step, how simple it is to setup PhpStorm and XDebug to debug a TYPO3 ExtBase extension. Of course you can also debug every other TYPO3 component with this setup. Before you can start with debugging, you need to setup XDebug, a debugging extension for you webbrowser and your PhpStorm project. First you need to install XDebug on you system and add the following lines to your xdebug.ini (on Ubuntu 12.04 the file is located at /etc/php5/conf.d/xdebug.ini) configuration file. Make sure you restart your webserver after you have added updated the XDebug configuration file. Next you need to install a debug extension for you webbrowser. Since I use Google Chrome, I install the Xdebug helper, which is open source (on GitHub) and available on the Google Chrome Web Store. Finally configure the server in you PhpStorm project settings like shown below. There are 2 important things to keep in mind. Symlinked files/directories must be mapped manually. On the screenshot above I map the typo3_src folder and the project-folder to to real location on my filesystem. That's it - now you are ready to debug your TYPO3 ExtBase extension in PhpStorm. Now it's time to start the debug session. 1. Enable your browser debug extension for the website you want to debug. In Chrome you just click on the debug icon. 2. Enable PhpStorm to listen to debug sessions by clicking on the icon shown below. 4. Open the website on the server. PhpStorm now catches the incoming debug session and stops at the first breakpoint. 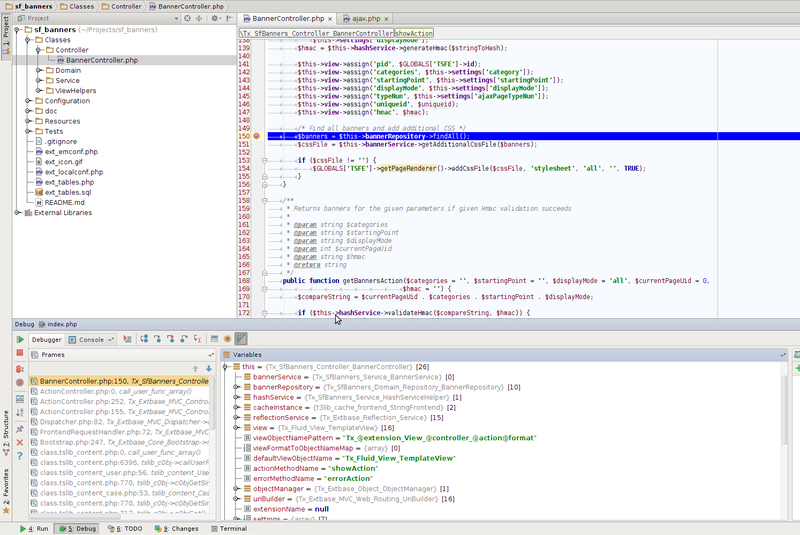 As you see on the screenshot above, PhpStorm stops at the breakpoint which has been set in step 3. 1. PhpStorm claims port 9000 is busy. When the debugger does'nt stop at the breakpoint, then it could be, that there is something wrong with the path mapping. I resolved this by adding xdebug_break(); to my code which resulted PhpStorm in stopping at the line with xdebug_break() and I could fix the path mappings at this point manually.